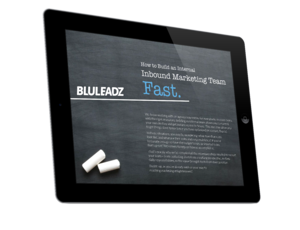 One of the most amazing and game changing benefits of inbound marketing is the depth of information you can gather. 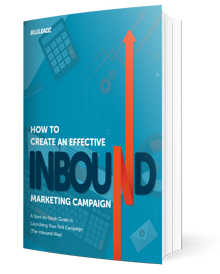 Traditional marketing, while effective, was always difficult to pin down exactly how effective it was. Today, digital marketing has changed all of that. Analytics examines all kinds of data points including where your prospect came from, how long they spent on your site, what content they interacted with, what actions they took on your website, and much more. Customer feedback is an essential component in every business toolkit. In today's online world, while analytic metrics are extremely detailed and useful, the business environment is competitive. Your customers and potential customers have plenty of options, so being able to understand why they chose your company is very useful information to possess. In order to compete with other businesses, you have to keep your customers happy by understanding your business, your customers, and the overall customer experience. How can you do just that? By asking your customers directly. Customer feedback software is one way to go beyond analytics, engage directly with your customers, and measure and improve customer satisfaction. 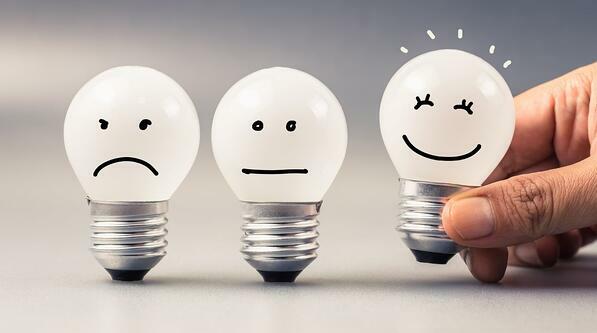 Customer feedback software can also help you to gain valuable insight from customers as to how you can improve your product or service, identify unhappy customers, and reduce churn. There are many customer feedback software products available. Some allow you to track comments in real time, and all will give you the ability to better understand your customer's experience. Let's take a look at our top nine customer feedback tools available on the market today. 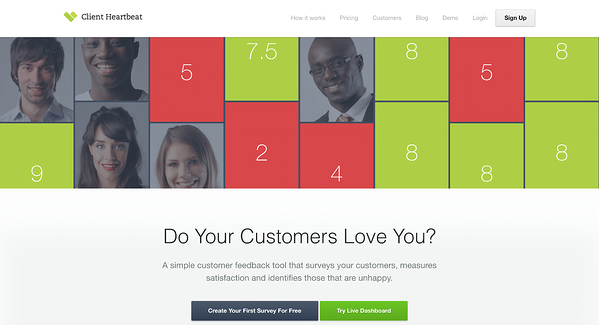 GetFeedback is a visually appealing tool that focuses on the user experience. 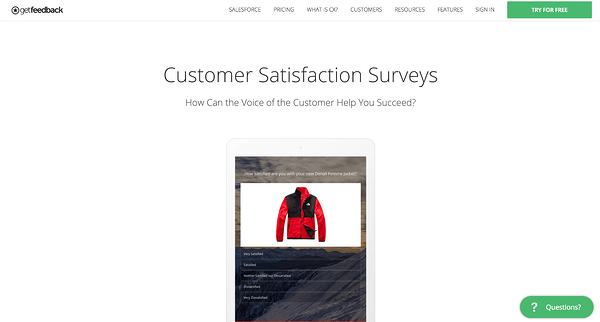 You can create surveys with images and customize the colors and fonts to fit your brand. Surveys on GetFeedback are more like having a conversation with your customer rather than just handing over a “survey.” And the process is easy for your customers. Basically, you send your customers a link in your “thank you” email, they fill out the survey, and you receive the data. Pricing starts at $50 per month for their basic survey platform. For bigger teams who need to add multiple users and who need more features like website forms, the Advanced package starts at $150 per month. Client Heartbeat enables you to send surveys to your customers via email and measures customer satisfaction over time. It offers a great feature, which gives you the option of using your customer satisfaction scores as a benchmark to compare against similar companies in your industry and region. You can automate the survey process so they are sent out based on time periods, such as three months or six months. You can just set it and forget it, and you can gauge your product over time. This is one of the best programs out there, receiving almost a 60 percent response rate. Plans start at $25 per month for up to 50 contacts and two surveys per year. 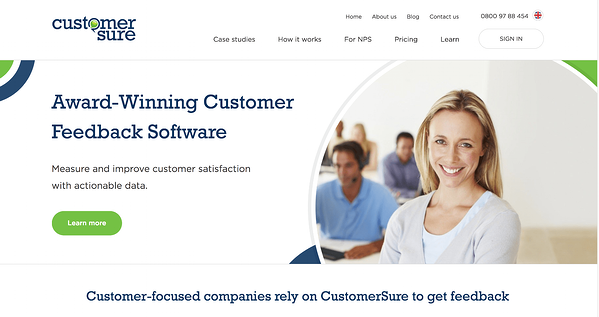 CustomerSure collects data by sending surveys via email. Your customers fill them out, and the feedback is collected into a customer service dashboard where you can find and fix issues. CustomerSure allows you to trend customer satisfaction over time, a widget on your website allows direct feedback, and extra features like Reviews and HelpDesk make it a a well-rounded platform if you're looking for more than just a customer feedback tool. The price for this platform is $49 per month and includes one survey and unlimited responses. SurveyMonkey is a popular online survey tool used by millions of businesses worldwide. It offers a wide range of features, but it is just a survey tool. There are no means for tracking customer feedback or managing it, so you'll need to take it outside of SurveyMonkey for analysis. The surveys are pretty basic, but they work. You set it up and send a link to customers. You are somewhat limited in terms of customization, which isn't great because branding and personalization can make surveys more useful. As a result, response rates are around between five and 15 percent. The free plan gives you up to 10 questions and 100 responses per month. The paid plan starts at $20 per month for unlimited questions and unlimited surveys per month, but with no branding. 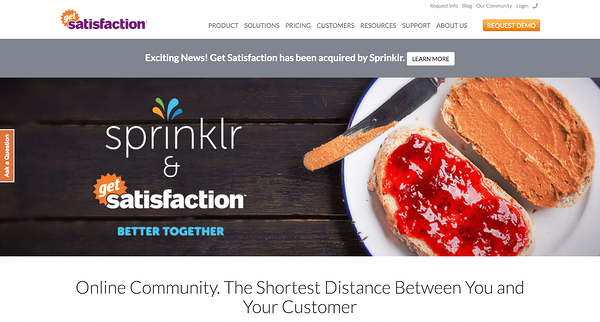 Get Satisfaction is a community platform that helps you get feedback and share it with other customers. This benefits everyone because customers with similar questions can use it as an FAQ. If you're looking for product launch testing and feedback, Get Satisfaction allows you to ask for customer input and have them vote on their favorite product ideas. This tool offers a widget that can be placed anywhere on your page. Clients who click are given four options – give praise, ask a question, report a problem, and share an idea. Another benefit is that it easily integrates with your CRM, help desk, social media tools, and marketing automation. Plans start at $1,200 annually ($100 per month) and includes unlimited users, unlimited surveys, and unlimited responses. Bazaarvoice is a great customer feedback platform with a lot of flexibility and options. You can collect ratings and reviews and allow shoppers to ask questions and deliver them answers, or both with Bazaarvoice Connections. With Bazaarvoice Connections, your company can easily collect reviews and answer any questions that pop up. The best news? It's an all in one, easy-to-use portal. Bazaarvoice Connections comes in one of two packages. 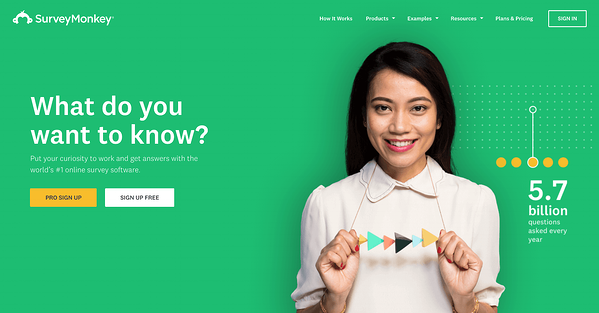 Connections Basic gives you access to 25 reviews, and you can answer all your customers' questions for free. And, when you're ready to learn more about Connections Premium to access all your reviews, it's any easy upgrade! If you're looking for a customer survey platform that easily integrates with your marketing application, Survicate is the one for you. Survicate works with HubSpot, Mailchimp, Slack, and more! 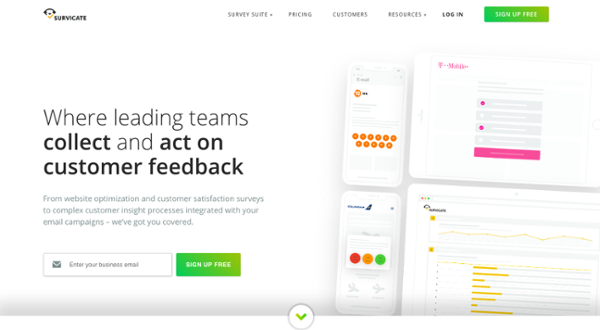 With Survicate, it's simple to collect feedback from customers who visit your website, embed surveys into emails, and even learn about your mobile app users. Essentials, the free option, comes with all the basic features and allows you to collect up to 50 responses a month (with the option to upgrade to 500 responses for only $50 a month). Professional offers everything the Essentials package does, and you can collect unlimited responses. It does come with more exclusive features such as design customization and branding, survey results export, and advanced survey targeting. This package starts at $159 a month; however, if you're an early-stage startup, Survicate understands the budget implications, so you're in luck: the startup price is $49 a month. Ultimate is the top-dog package with everything you can think of. For $549 a month, companies have access to all of the Professional package features, plus two-factor authentication, workspaces for domains and teams, and more. 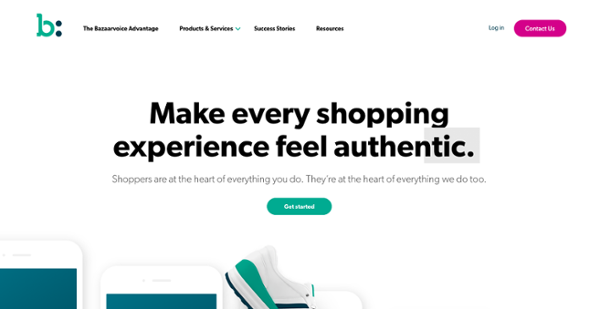 Reevoo's homepage mantra says it all: "Customers convincing customers. That's not marketing. That's life." Basically, Reevoo thrives off of getting valuable reviews from their clients' customers. They go out of their way to verify a customer completed a purchase before sending over an email asking them about it. And, they go above and beyond a typical review to ask questions about the purchase process and the service they received. Another great feature about Reevoo is that they will notify you when someone leaves a negative review or customer inquiry – allowing your team to be quick to respond. Pricing is a little different with Reevoo; in attempt to keep the price fair for everyone, what you pay depends on how much content they are able to collect. However, you can easily get a quote from them if you need a better idea. 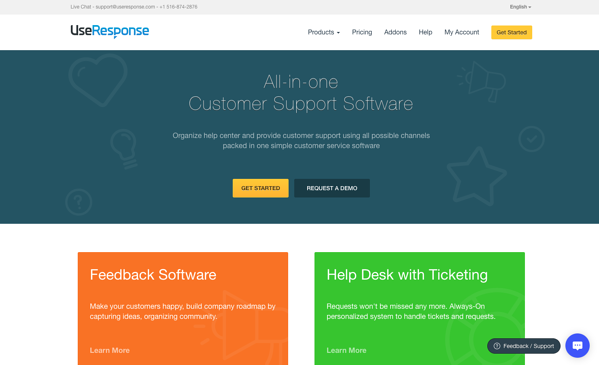 Touted as an all-in-one customer support solution, UseResponse covers all the bases. Your service team is set up to succeed with this tool. Need to build your knowledge base? Use their knowledge management software to create branded community portals, where you can share documentation. Build out your FAQs and create categories to organize knowledge base articles from one simple interface. There are several other perks to using this tool, like the omnichannel help desk software, where AI helps automate ticket assignments, the live chat tool that integrates with plenty of popular channels, and of course the feedback software. Plans start at $15 per agent per month for using one of their four platforms in the cloud subscription plan. You also have the option to self-host, starting at $899 for the first year fee. No matter the size of your business, you can find a UseResponse platform that fits. Adding a customer feedback component to your marketing strategy allows you to learn more about the people behind your sales and really see how your company rates in terms of customer service and customer satisfaction. Customer survey tools can be used to develop new related products based on feedback and can alert you to any problems you may be having so you can nip them in the bud and make proper adjustments in a timely manner. Today's business environment is competitive, and to truly succeed, you need to focus on your customers. The more information you have about actual experiences with your business, the more you can differentiate yourself from your competition. A customer feedback system is the perfect way to engage with your audience!